A-Matrix: "IS 500 A RE-2-5 A78761 RE-2-1"
B-Matrix: "IS 500 B-4 B-78762-1"
A-Label: Island picture with large hole. 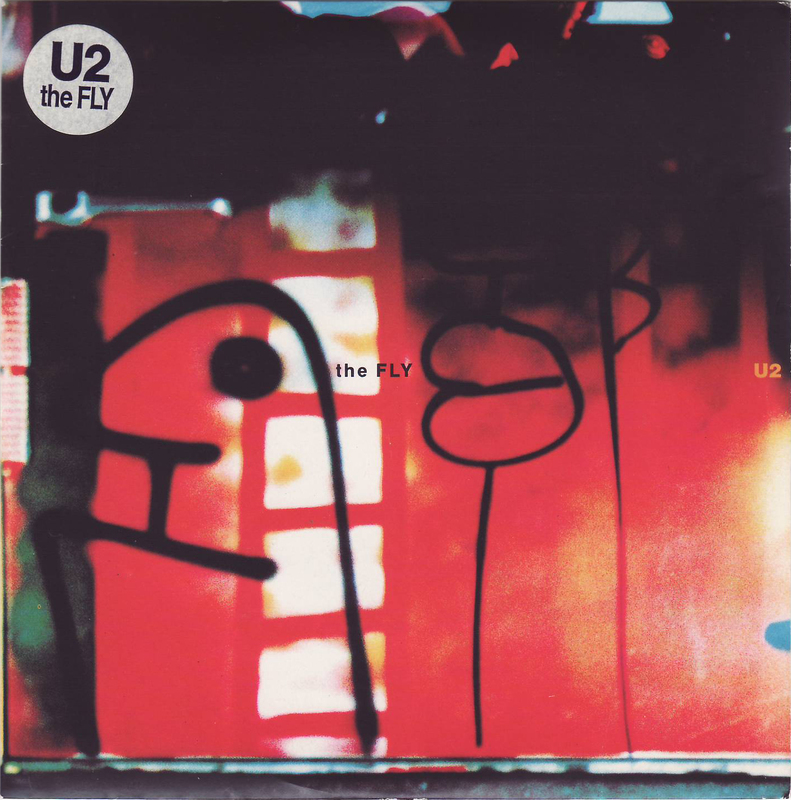 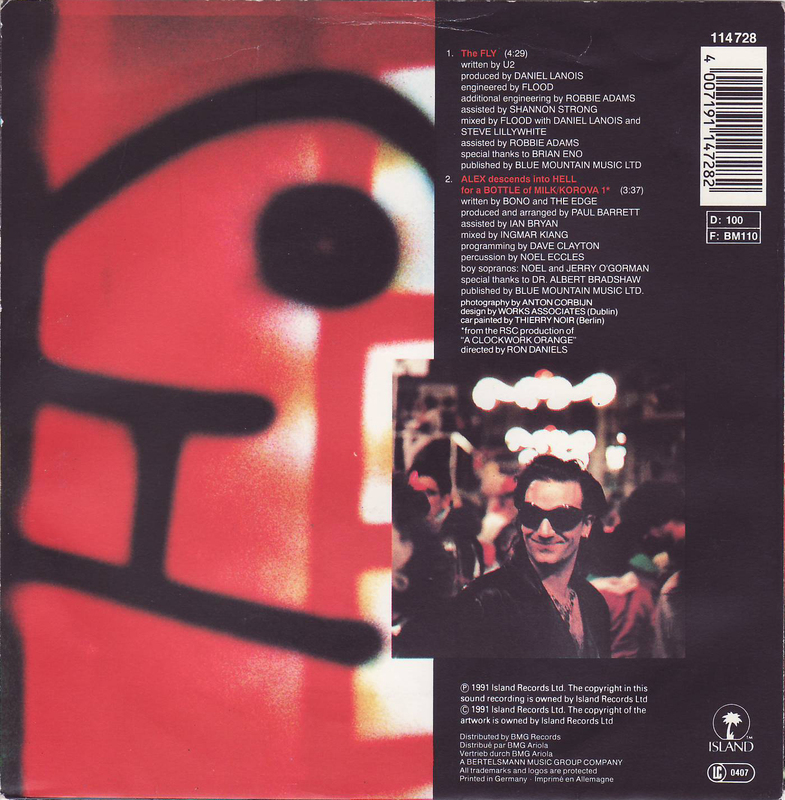 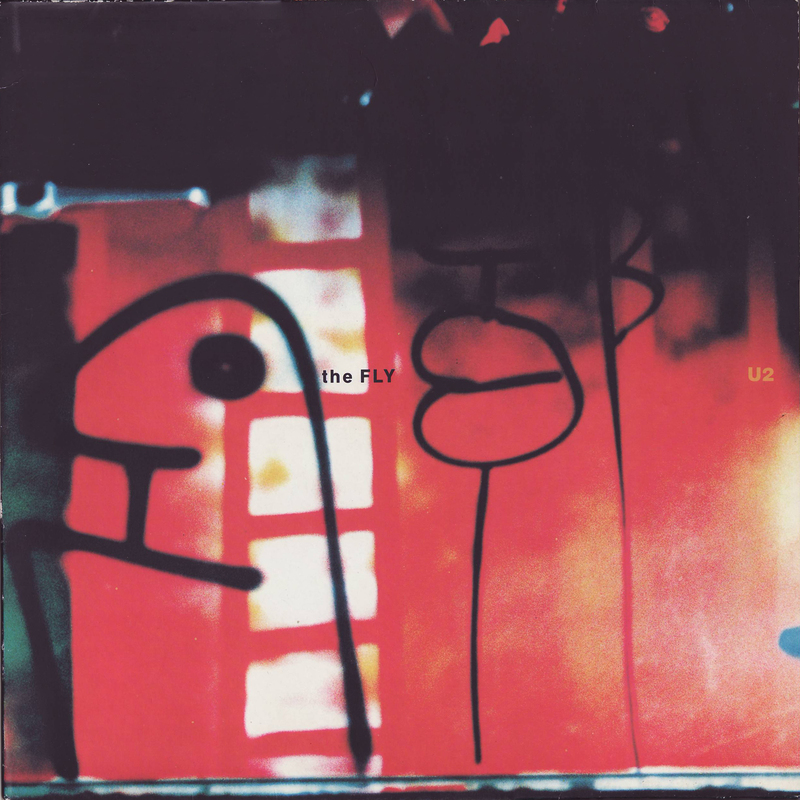 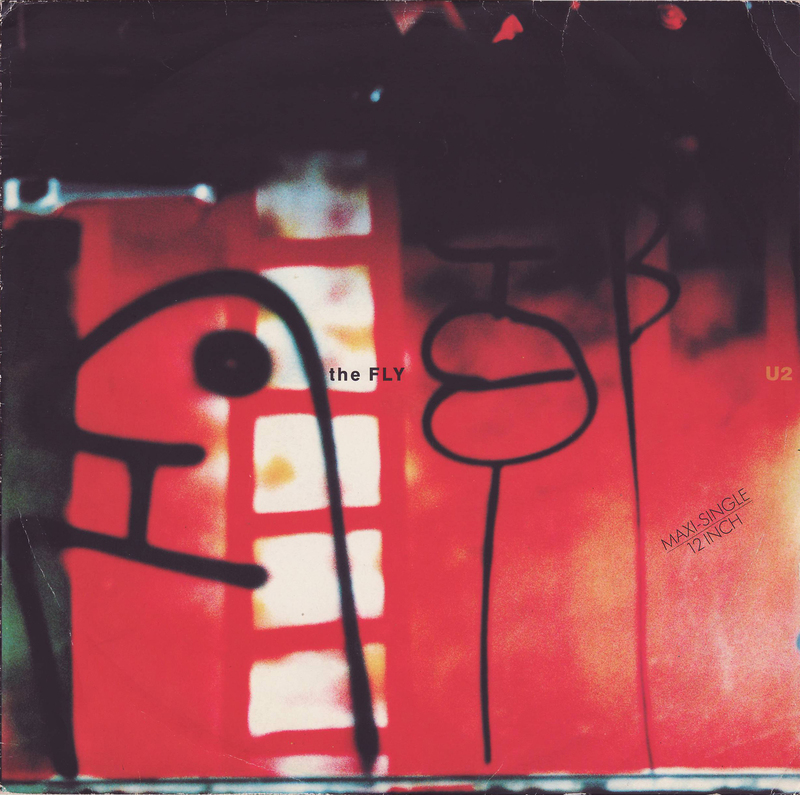 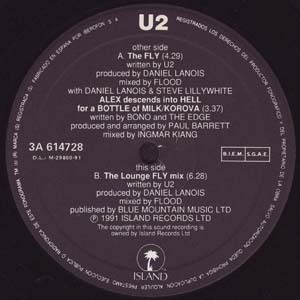 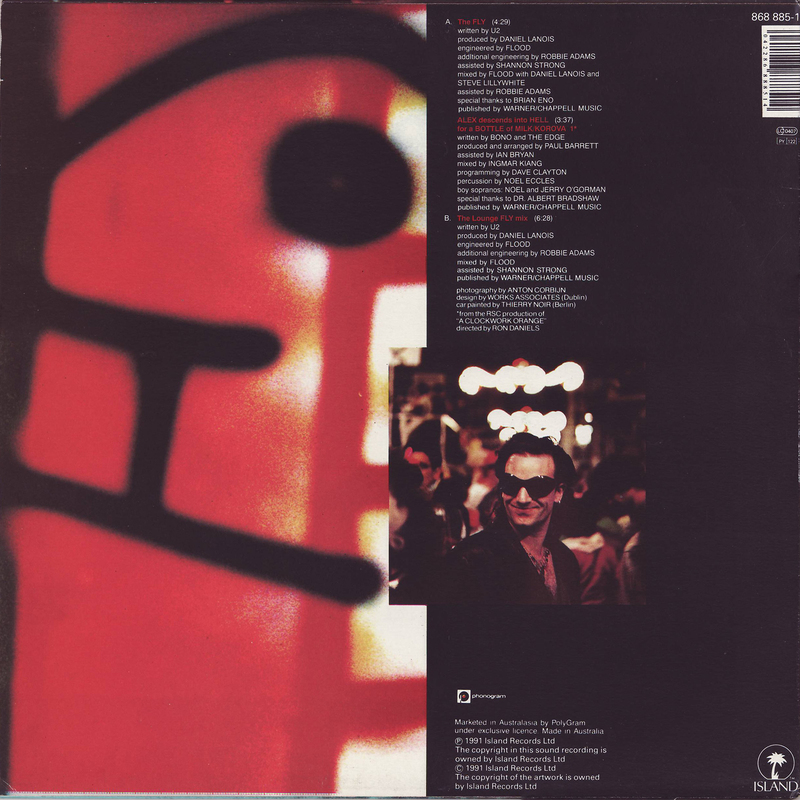 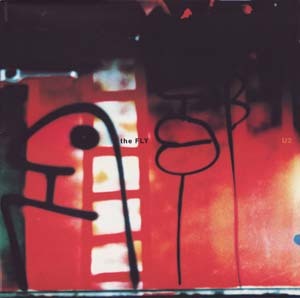 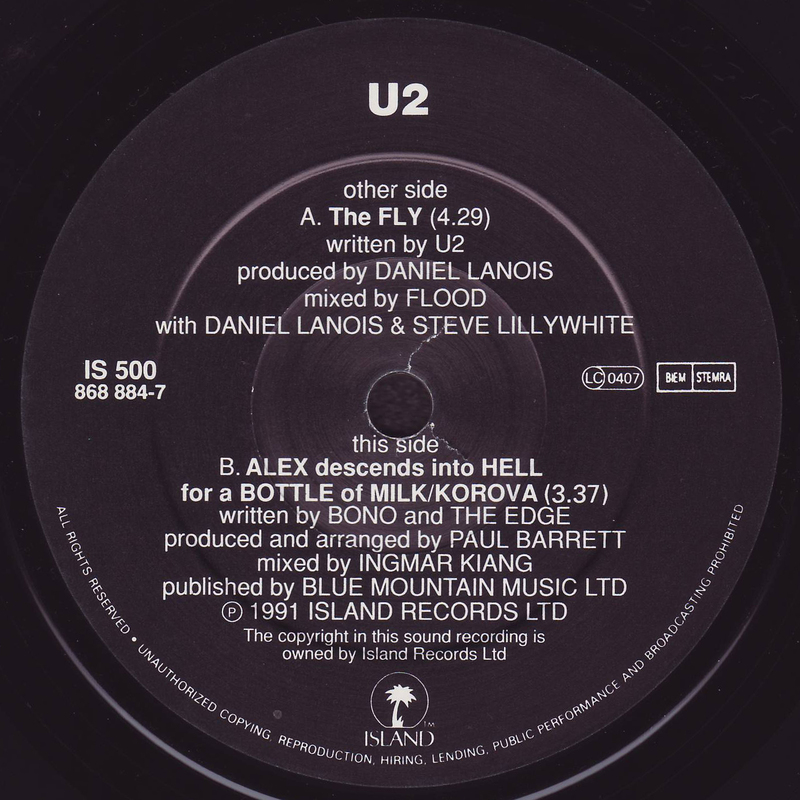 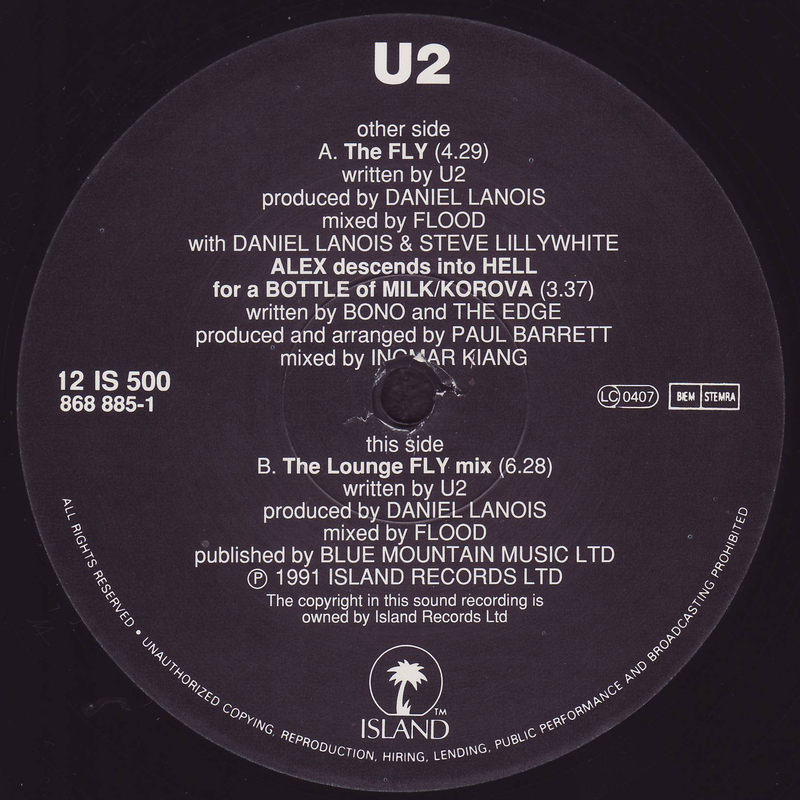 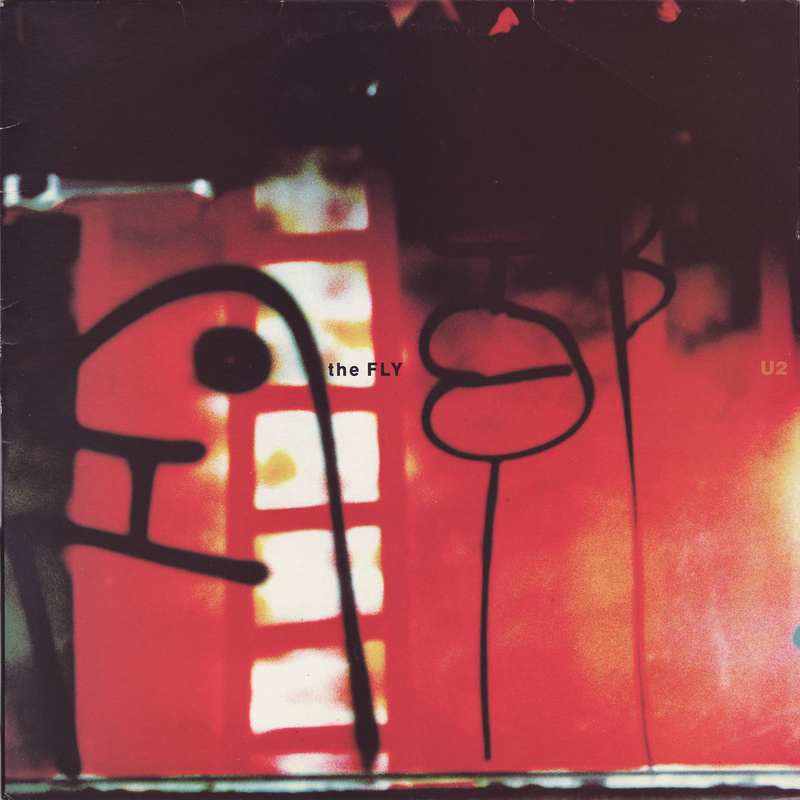 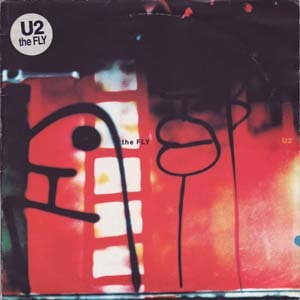 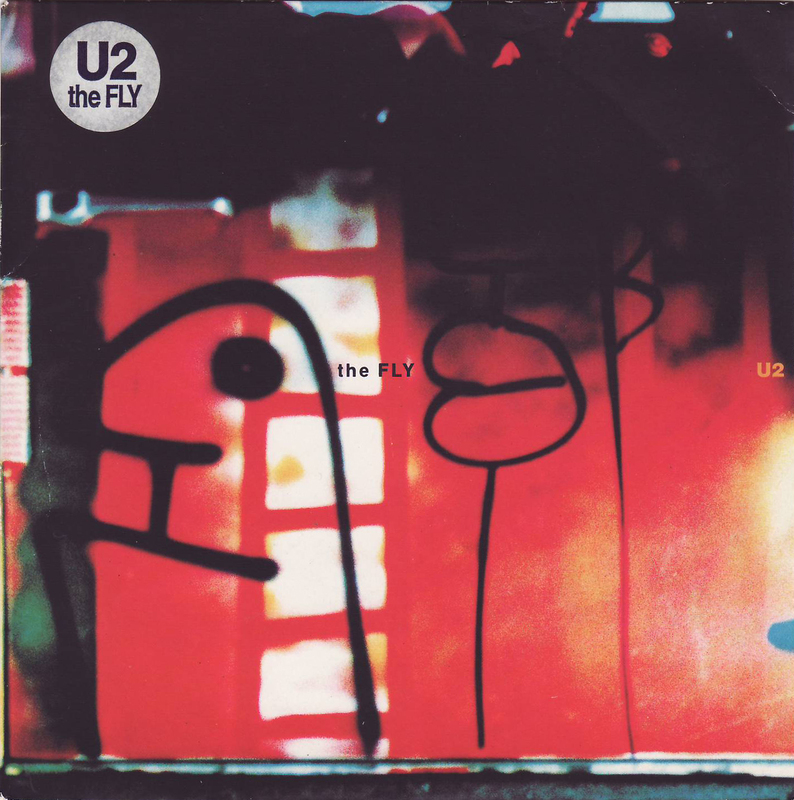 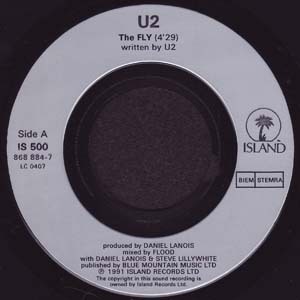 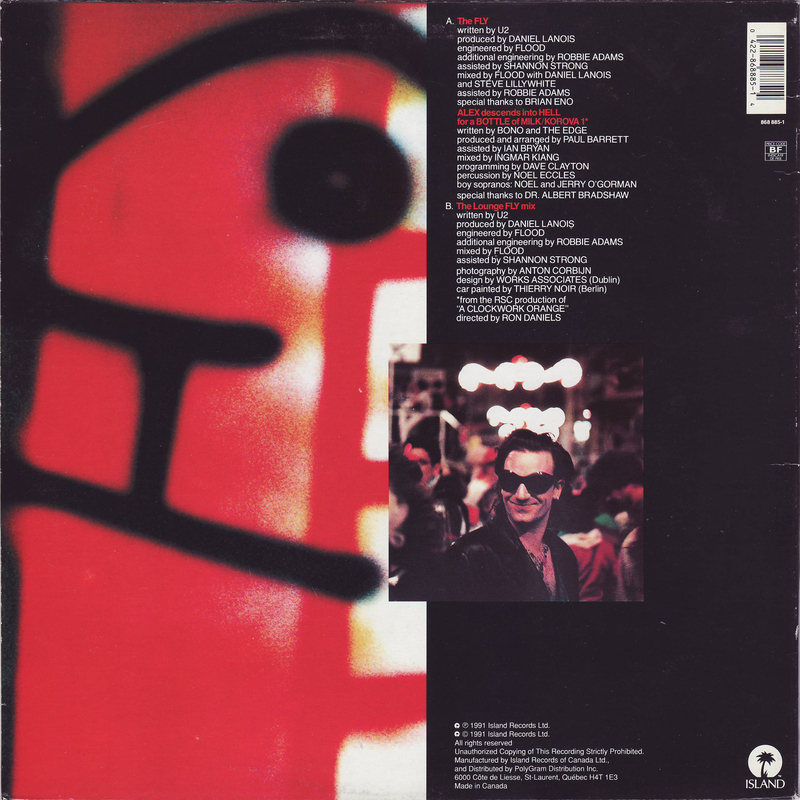 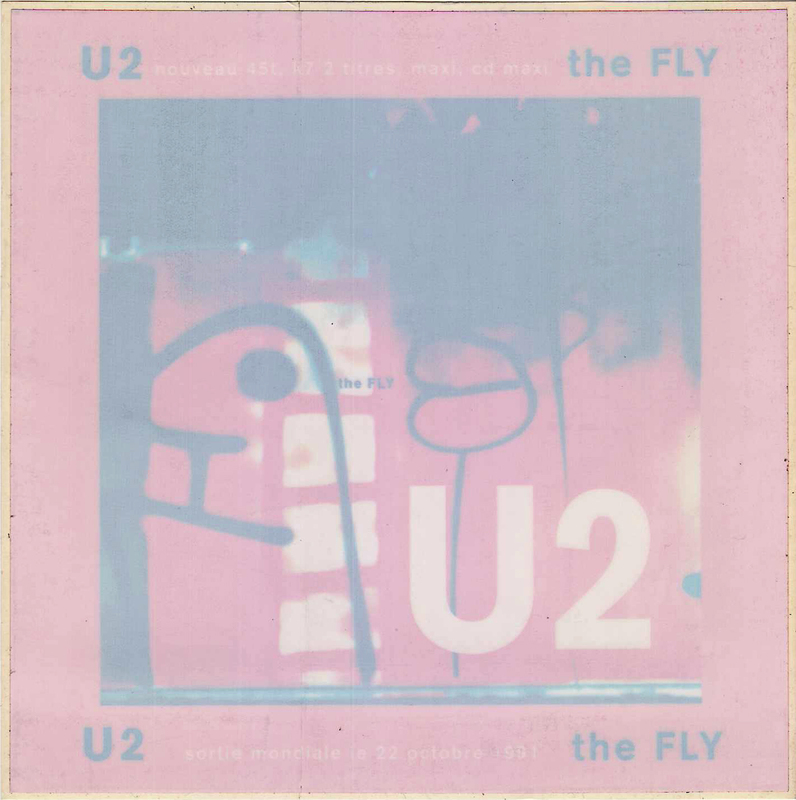 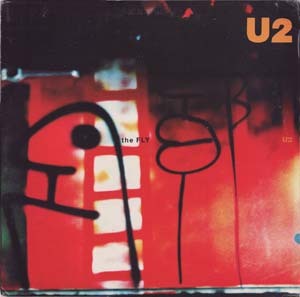 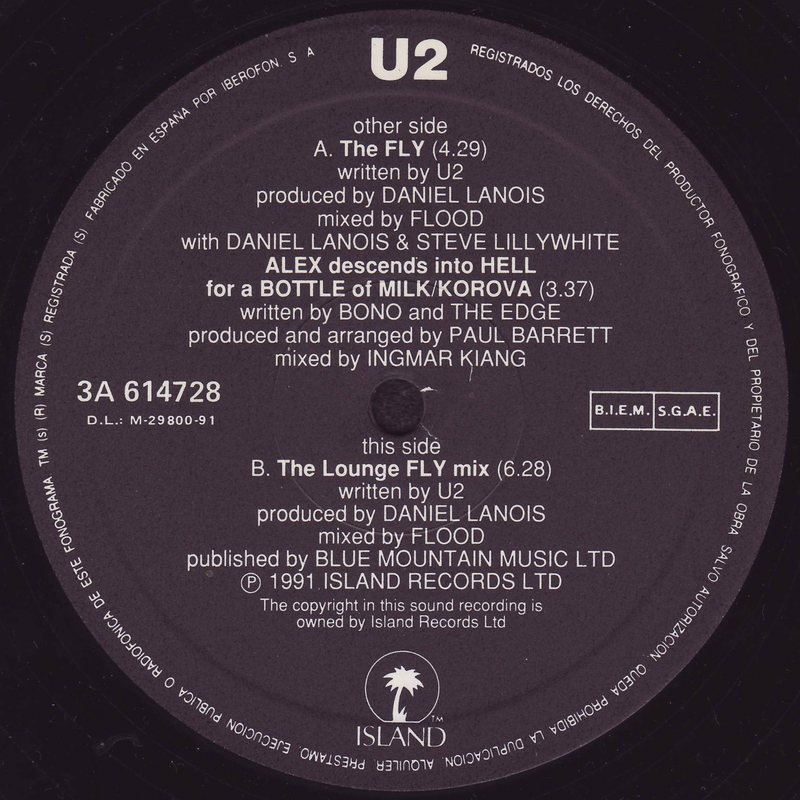 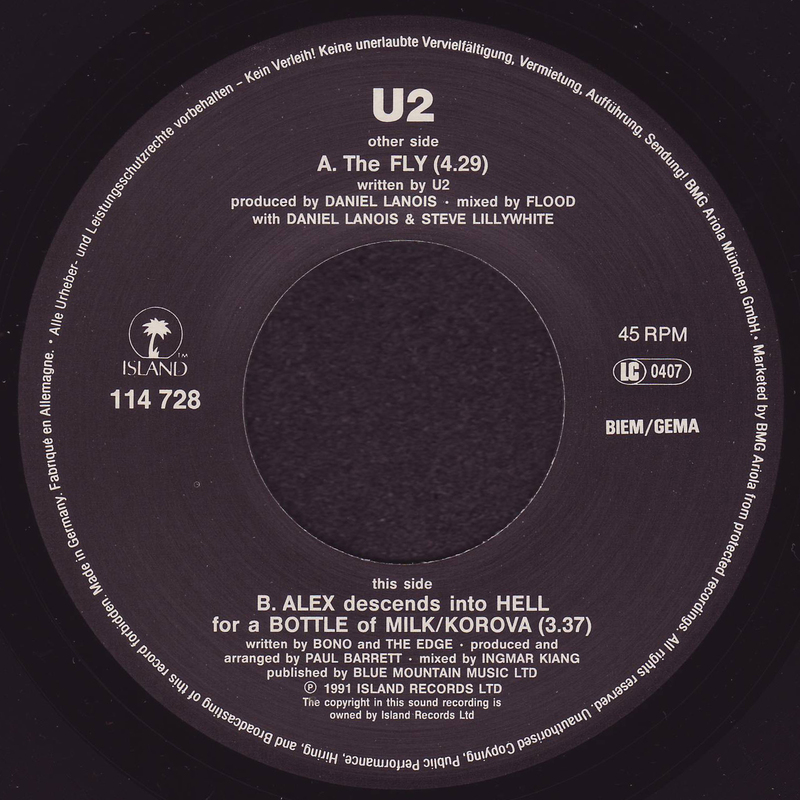 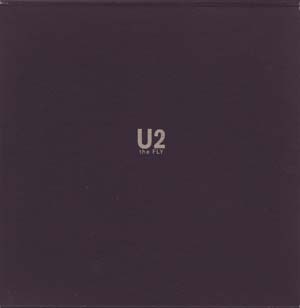 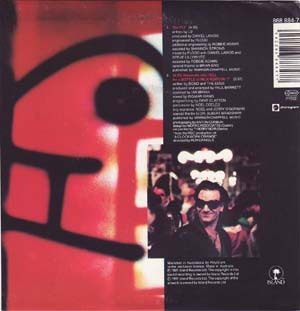 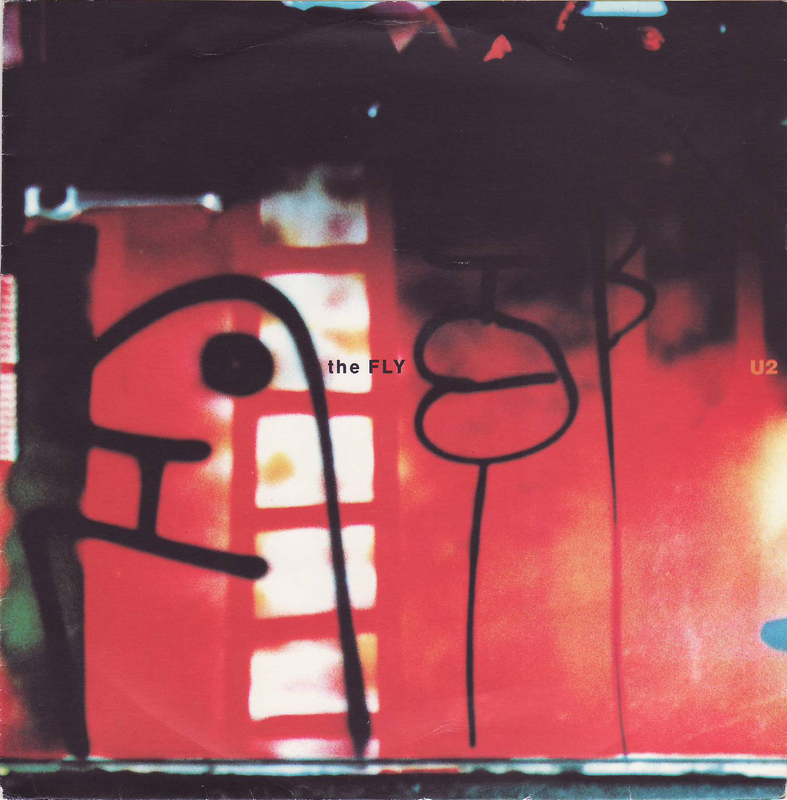 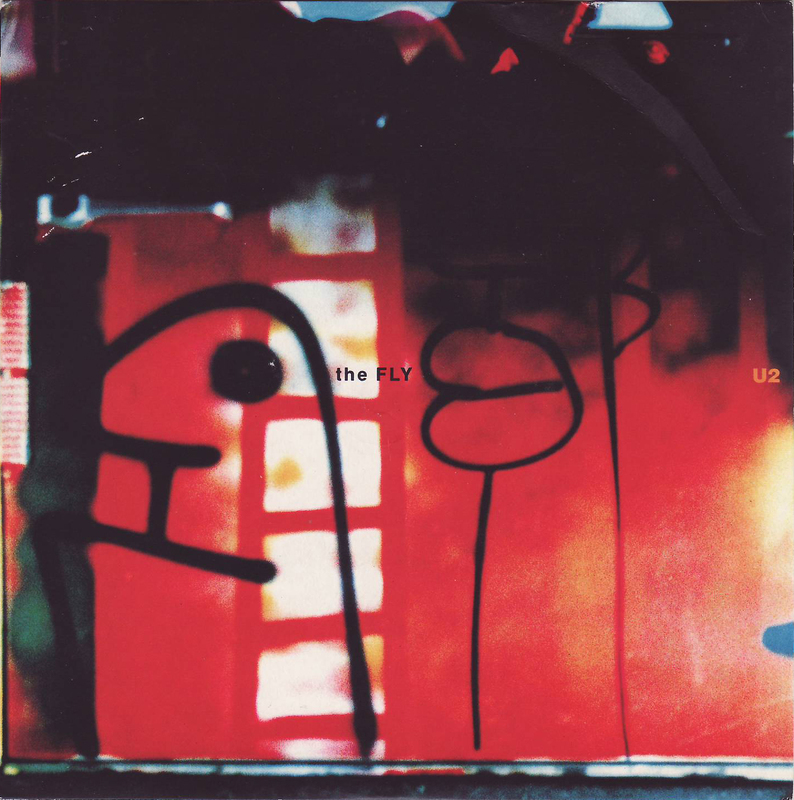 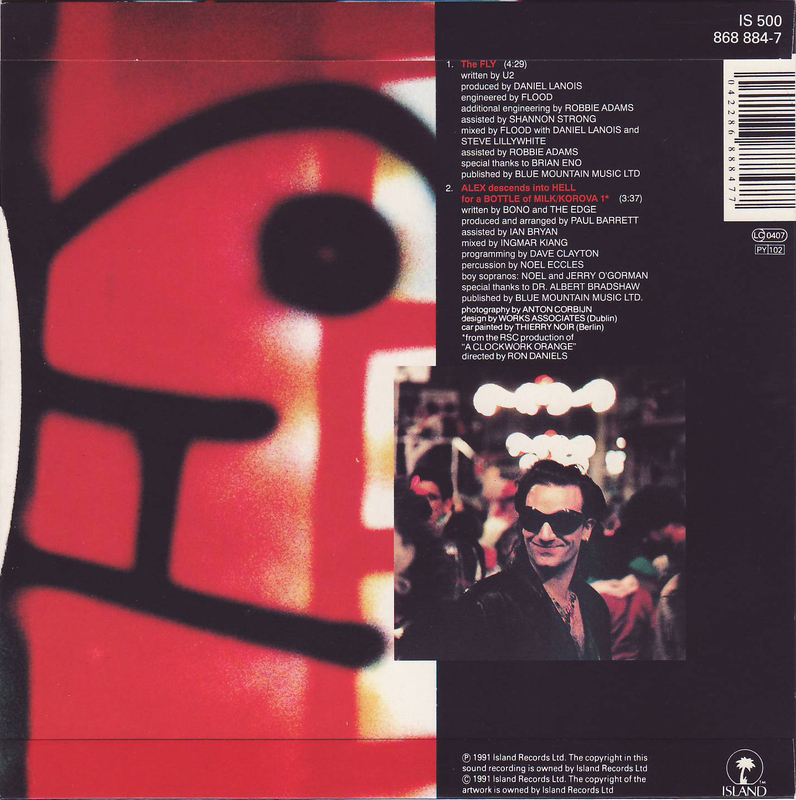 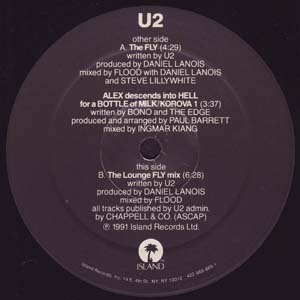 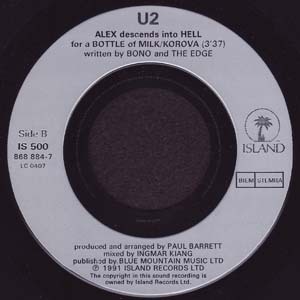 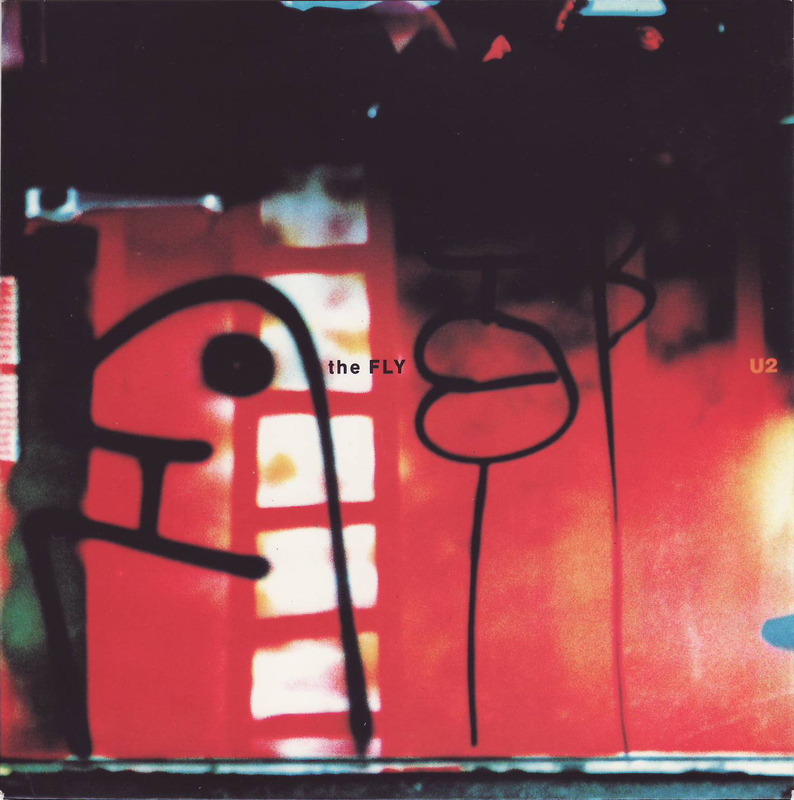 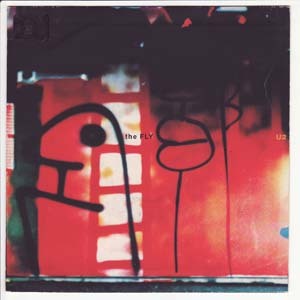 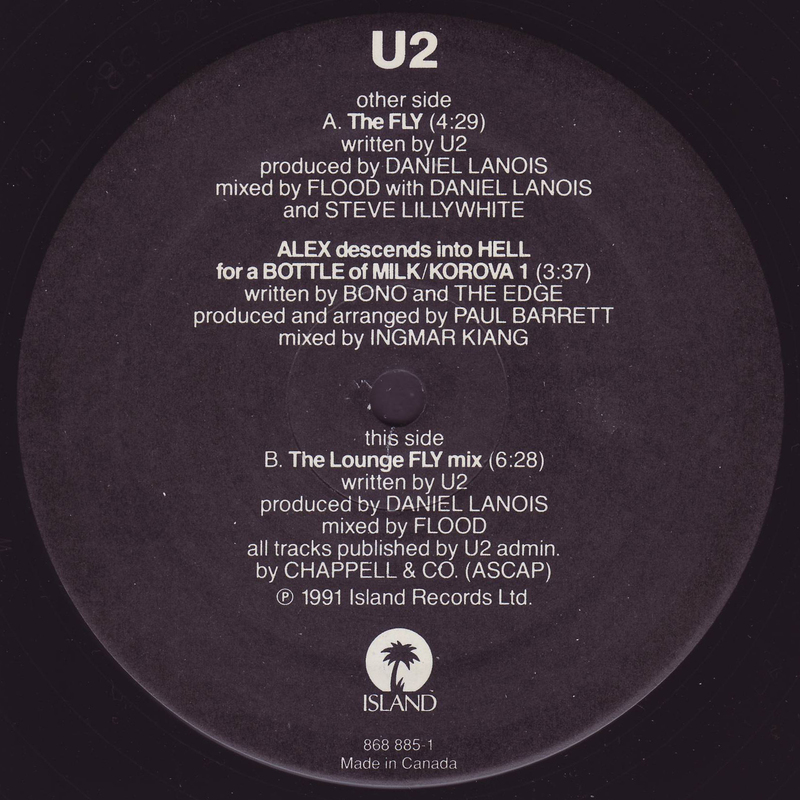 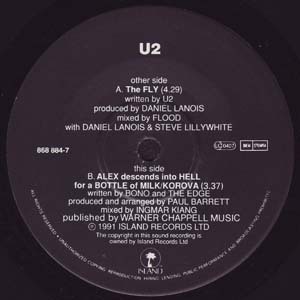 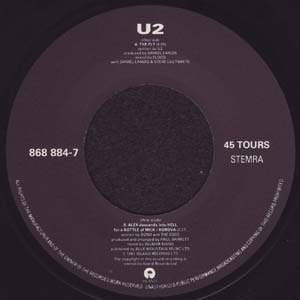 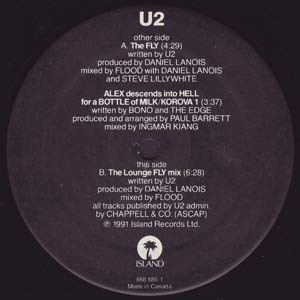 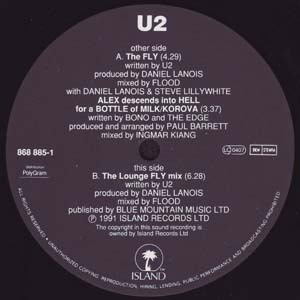 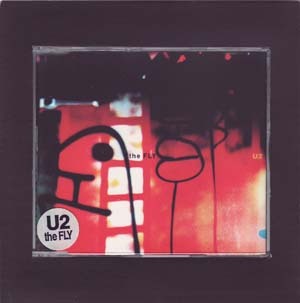 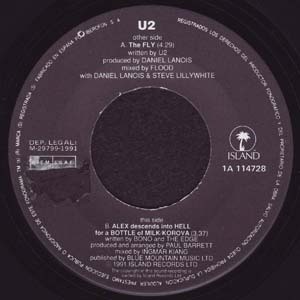 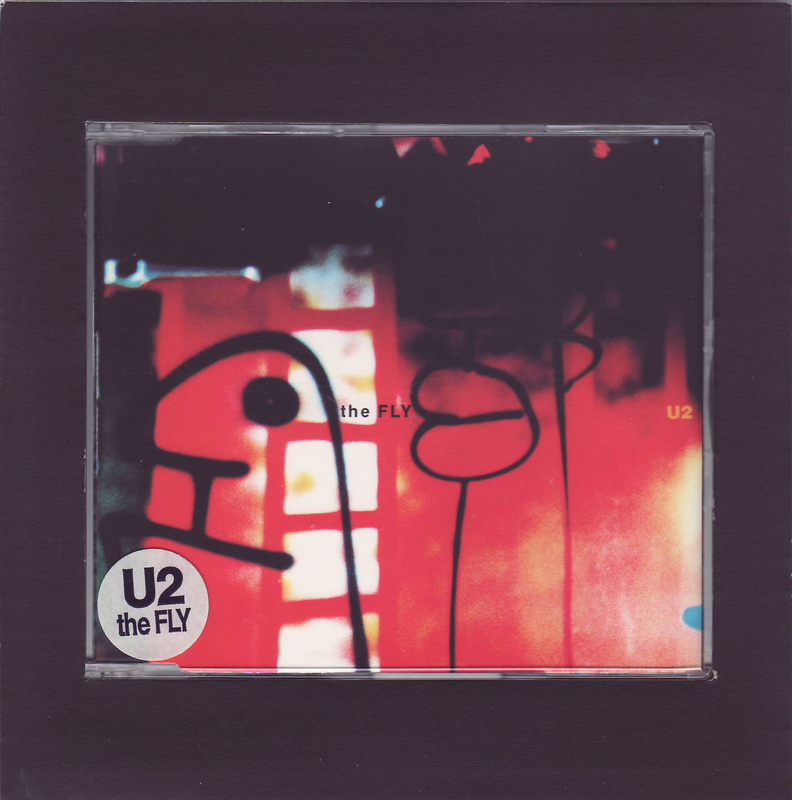 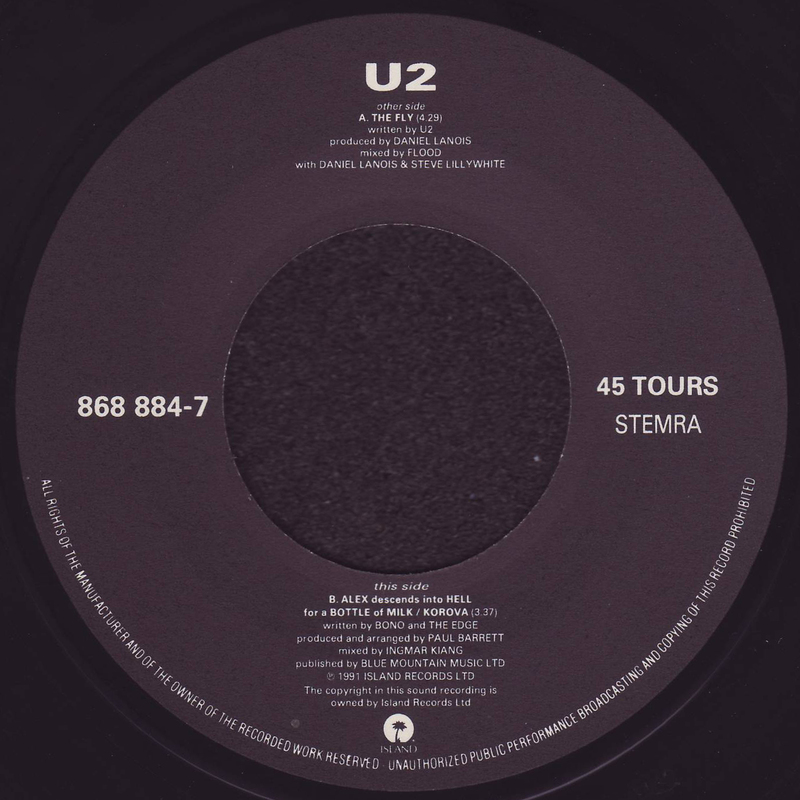 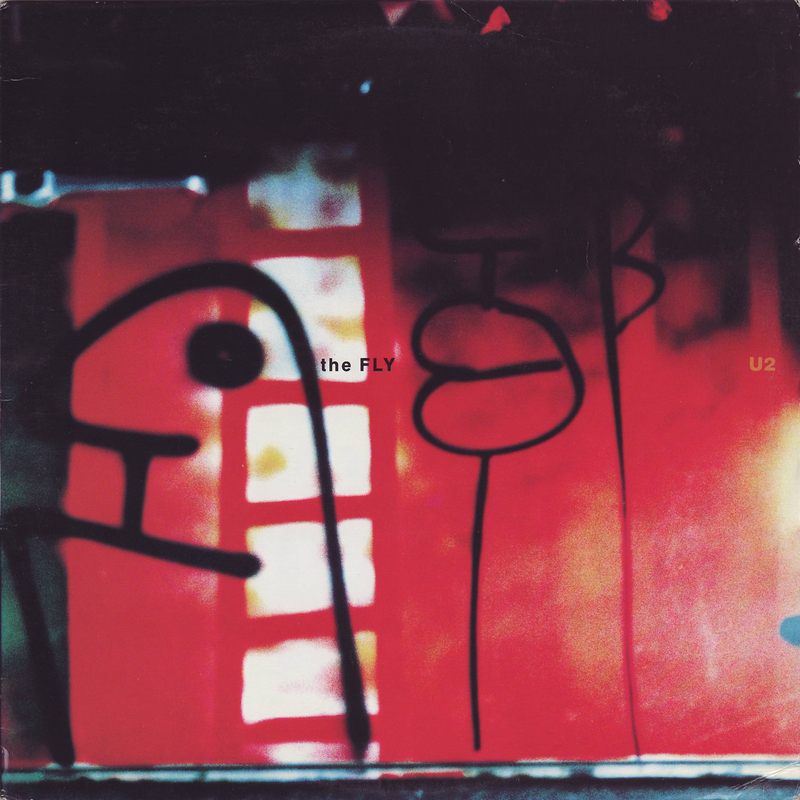 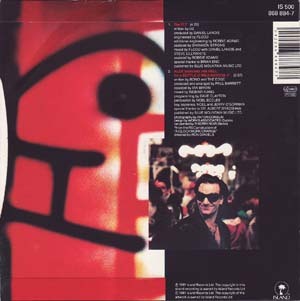 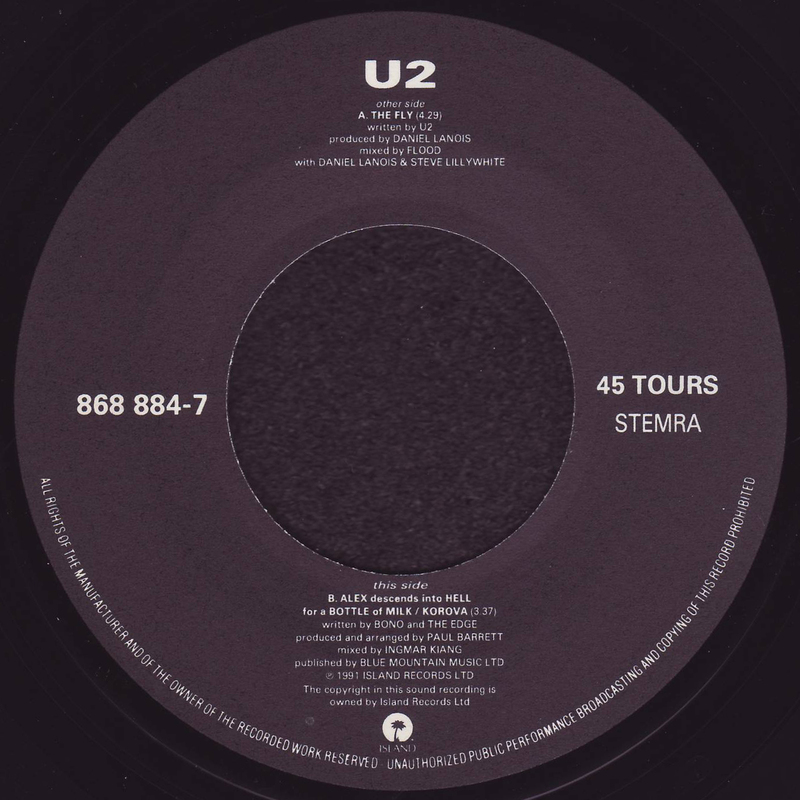 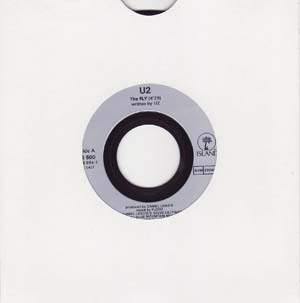 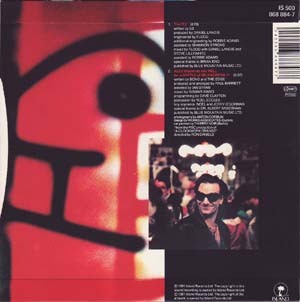 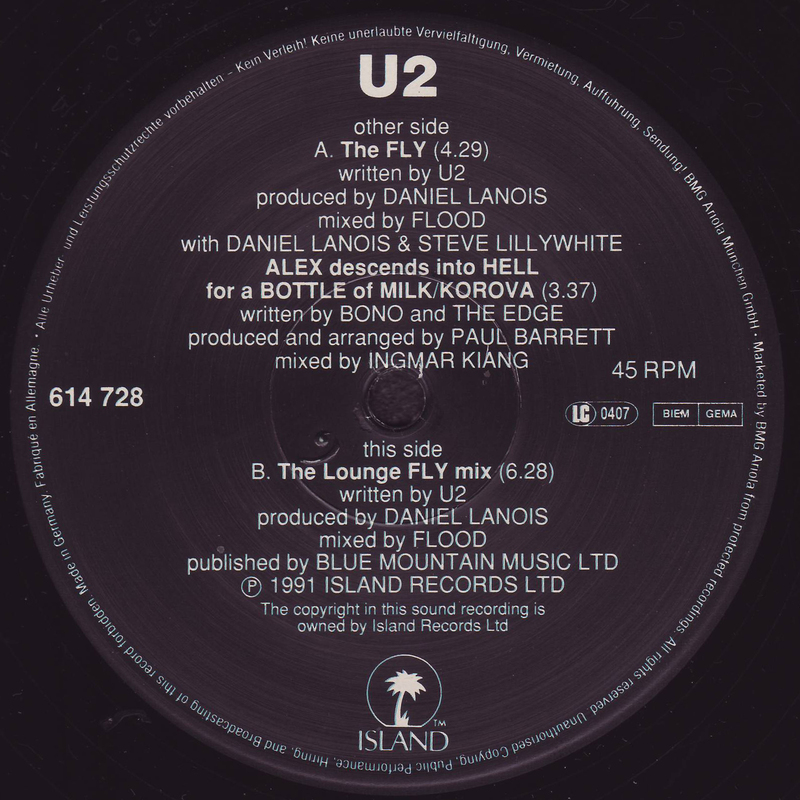 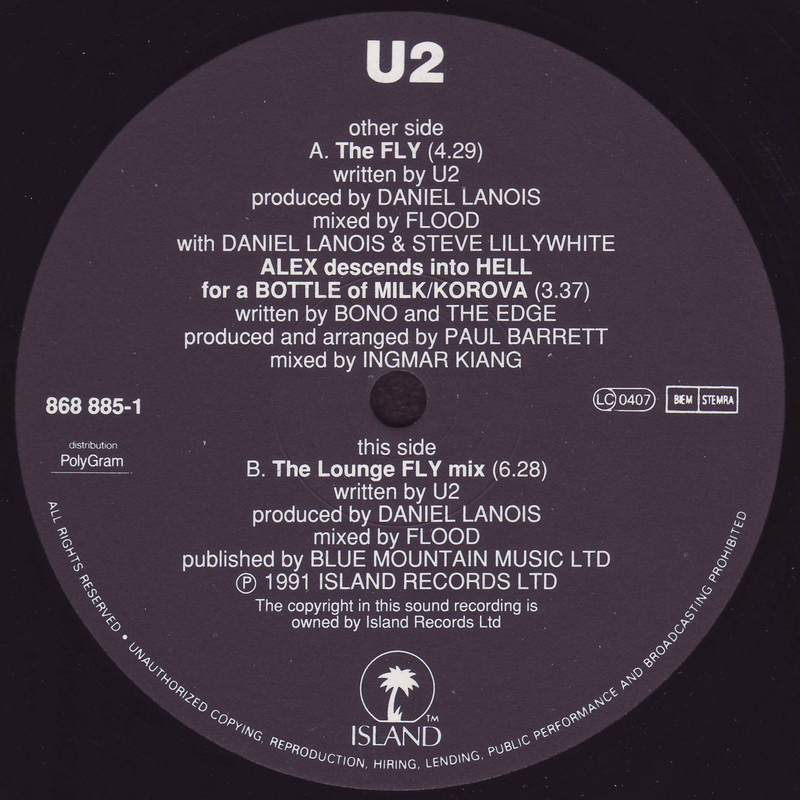 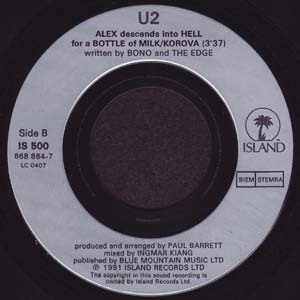 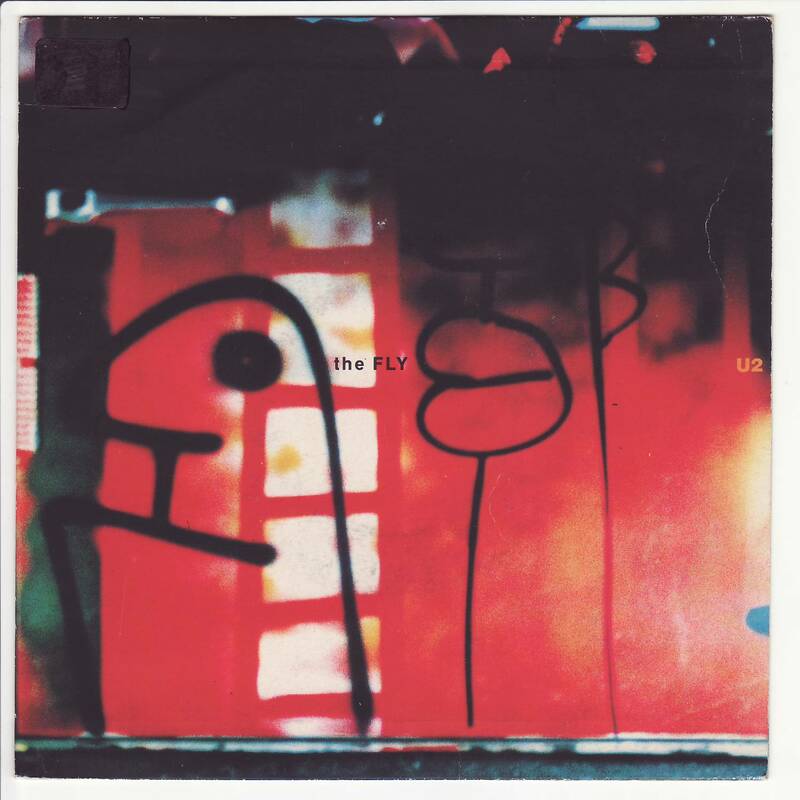 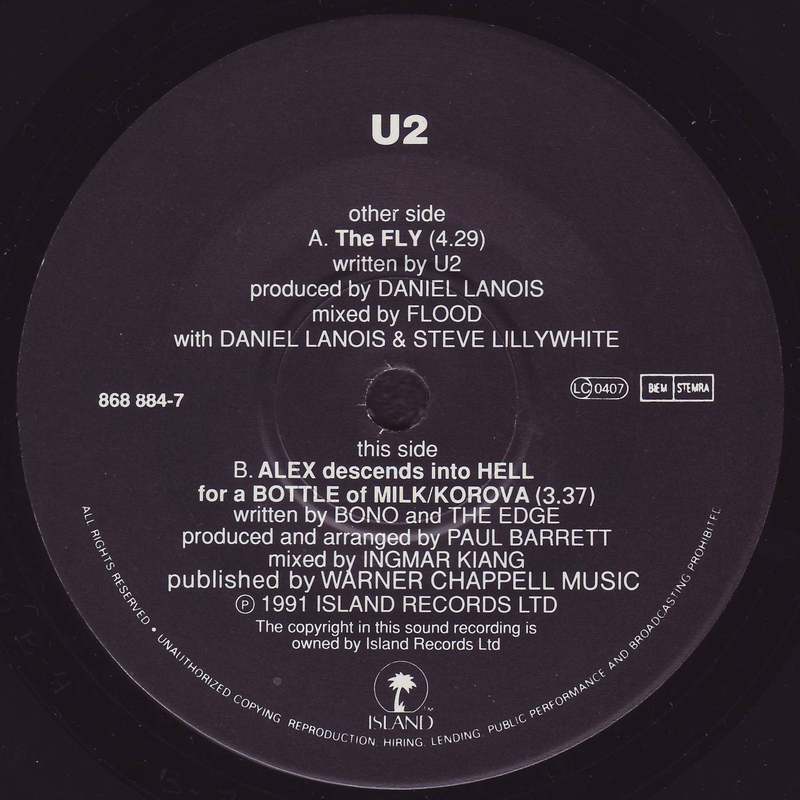 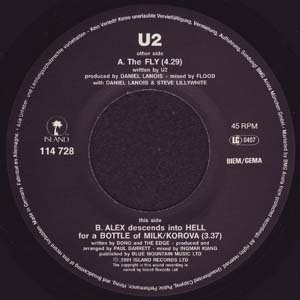 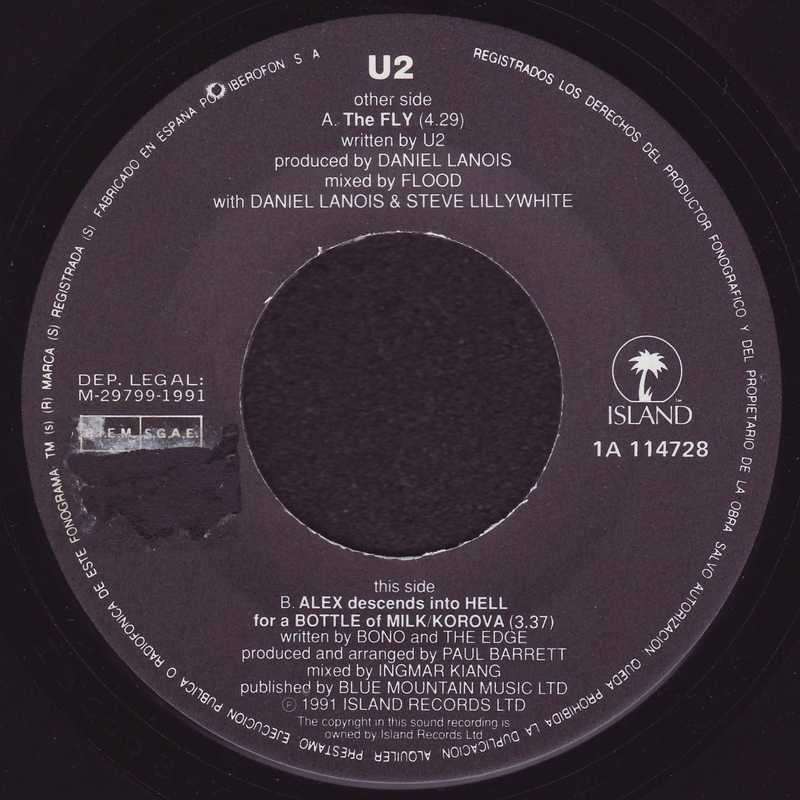 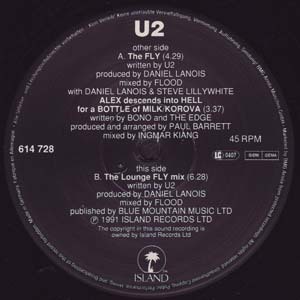 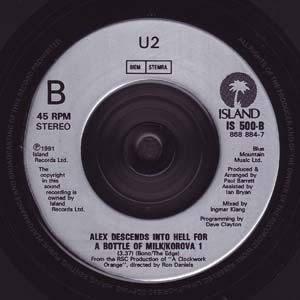 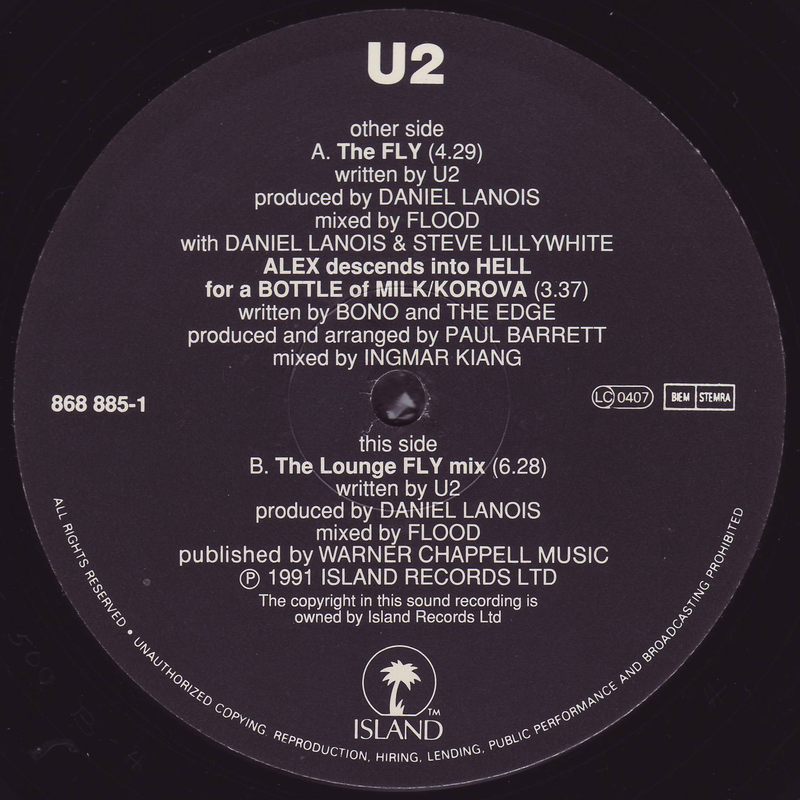 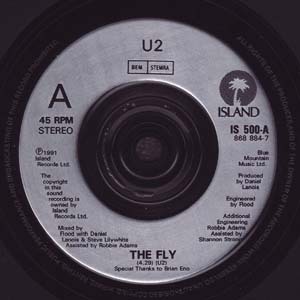 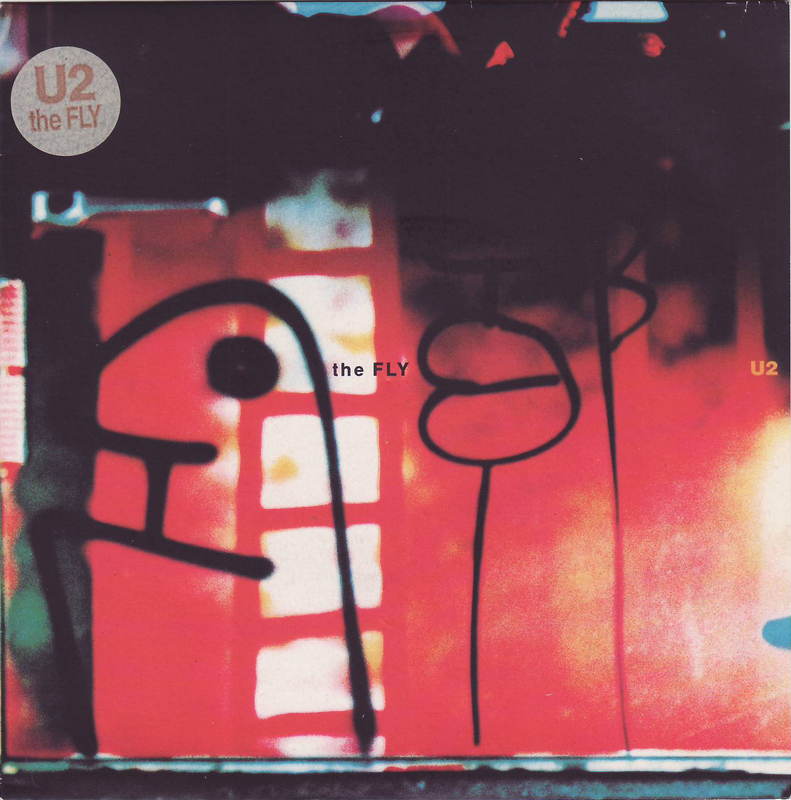 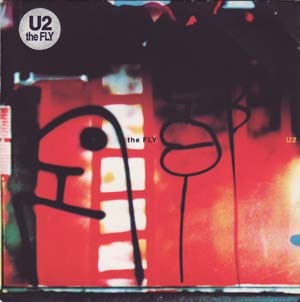 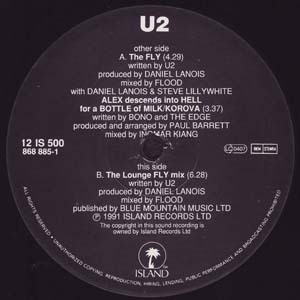 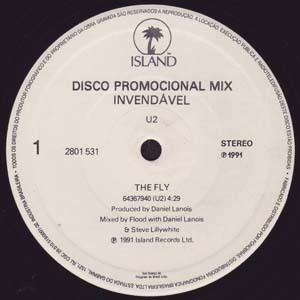 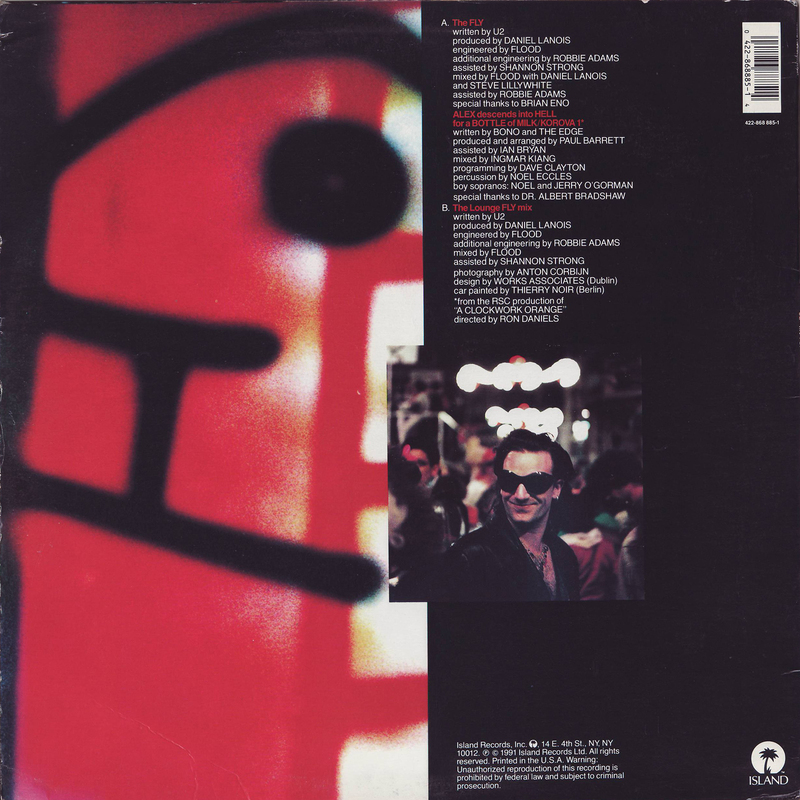 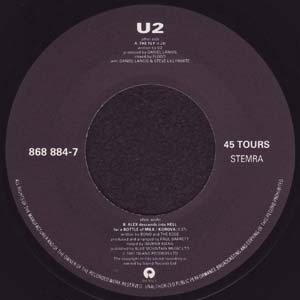 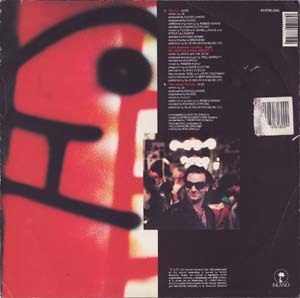 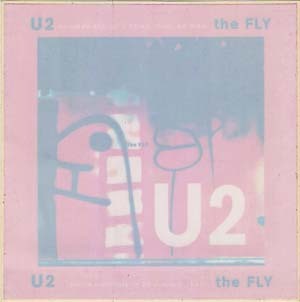 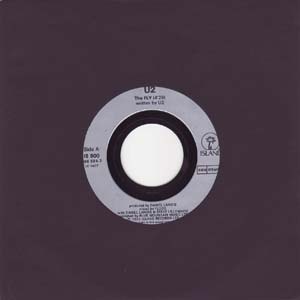 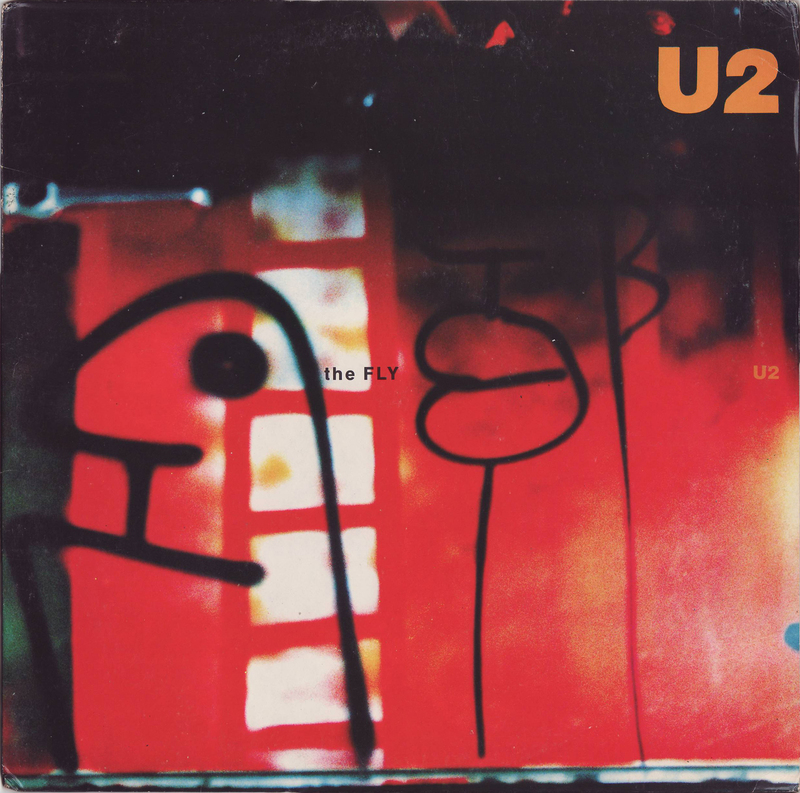 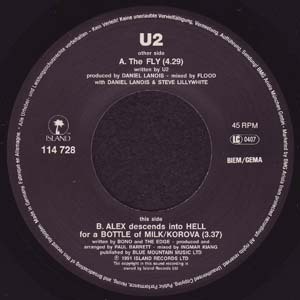 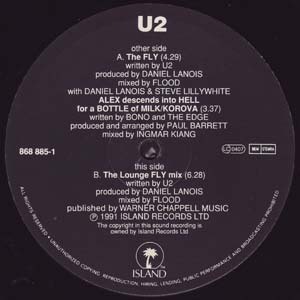 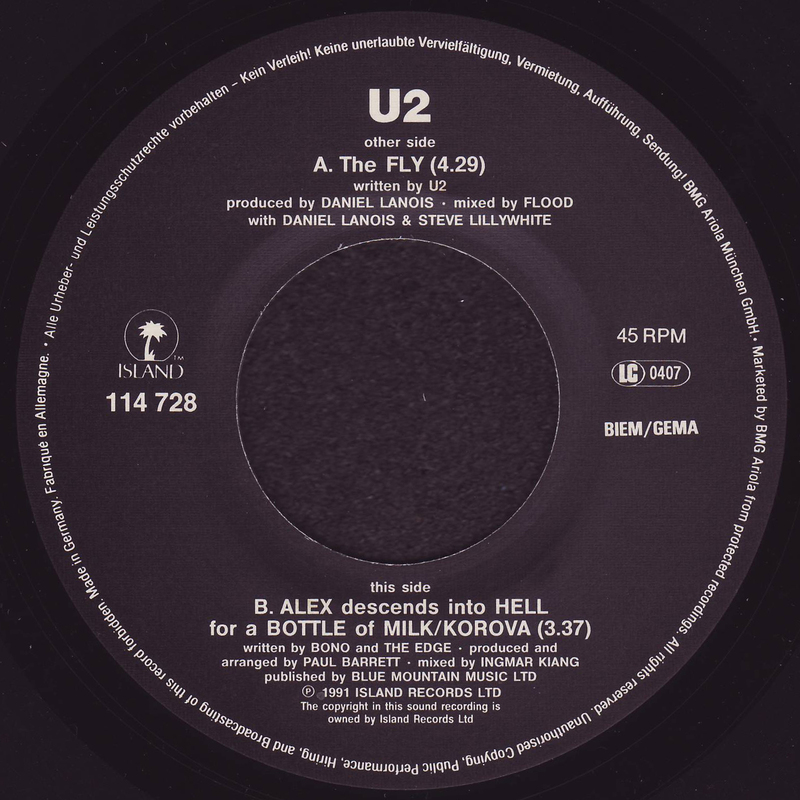 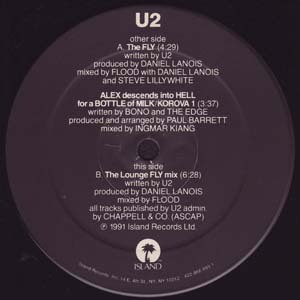 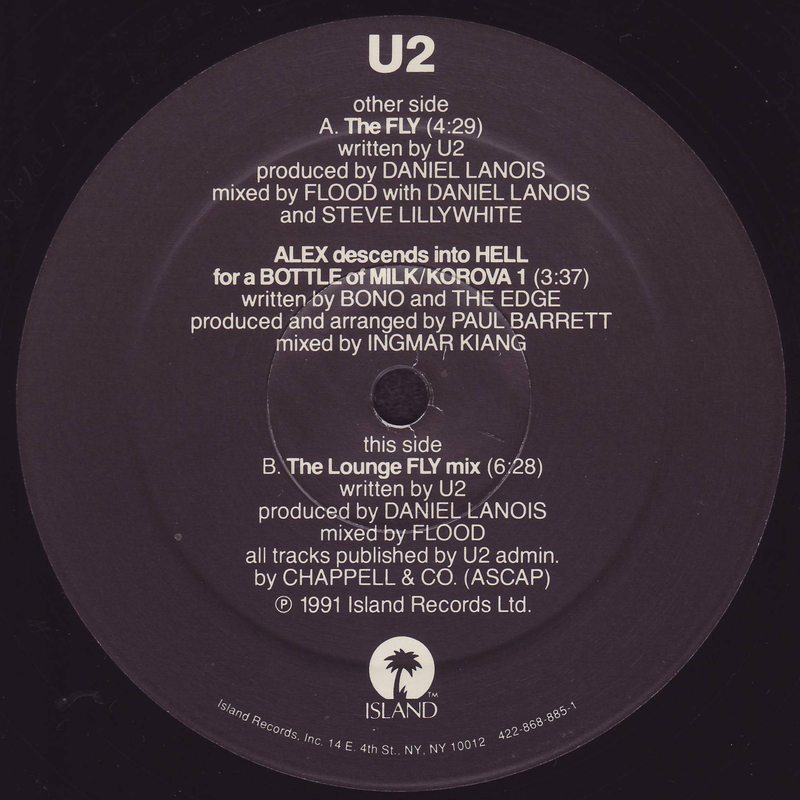 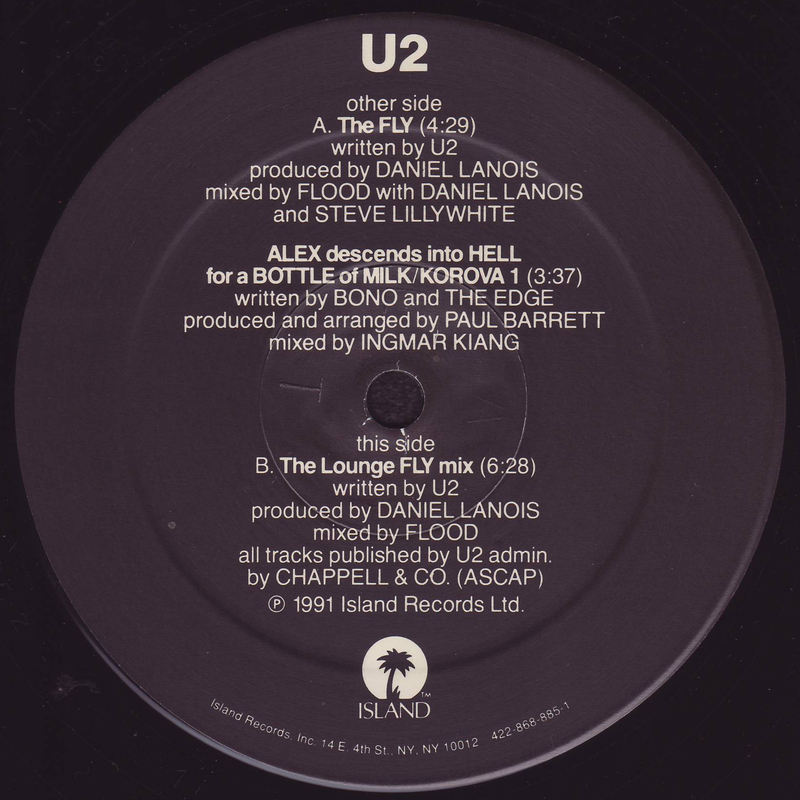 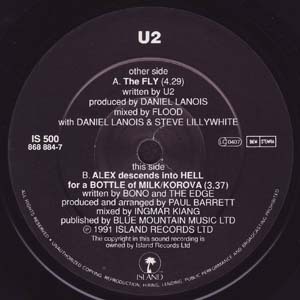 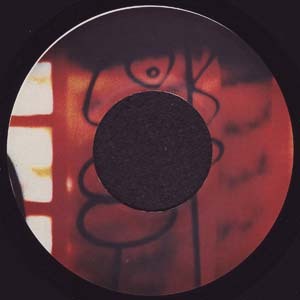 A-Matrix: "IS 500 A RE-2-4 868 8847-A RE-2 -2"
B-Matrix: "IS 500 B1 868 8847B-1 RDO"
Front of outer cover with "U2 the FLY". Back of outer cover is plain brown. 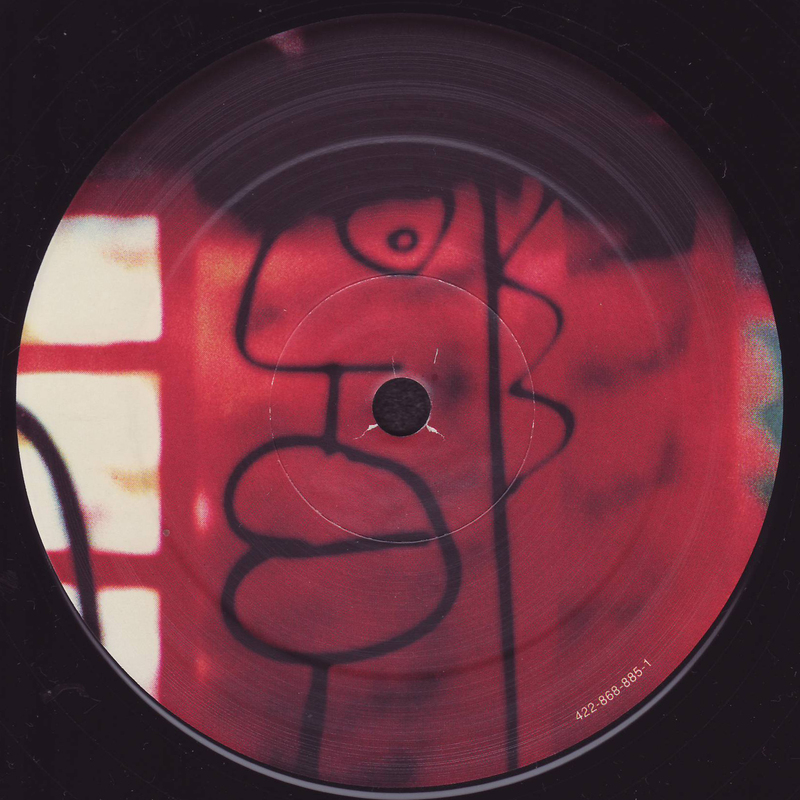 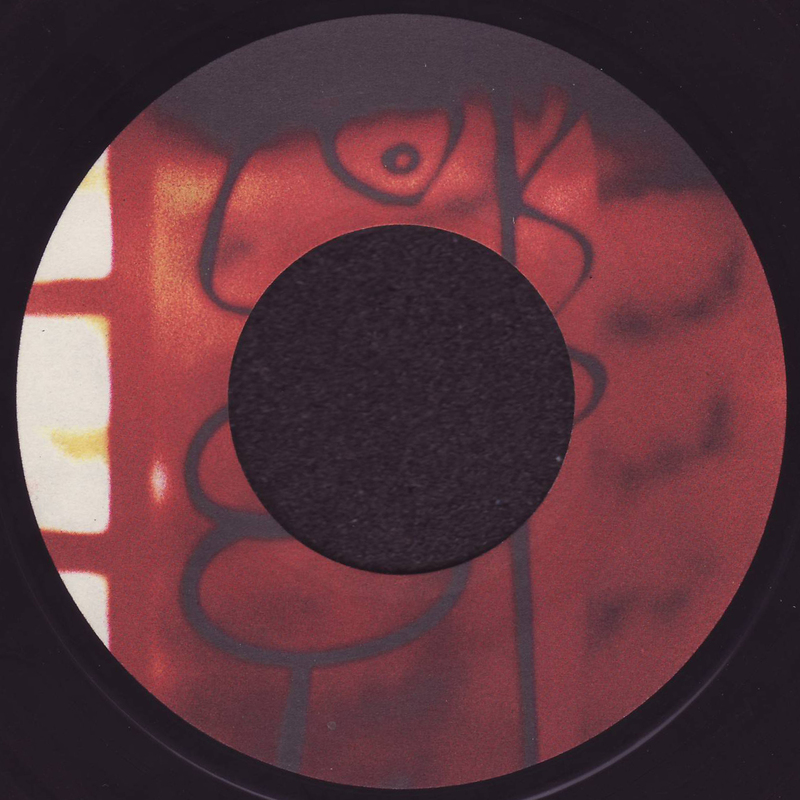 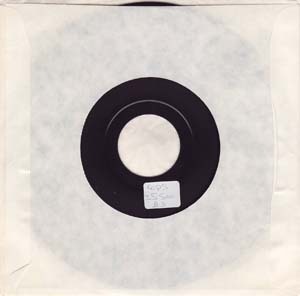 7 inch sticker inside peel-away papers. 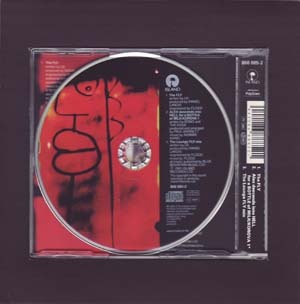 Front of CD with sticker inside cardboard surround. 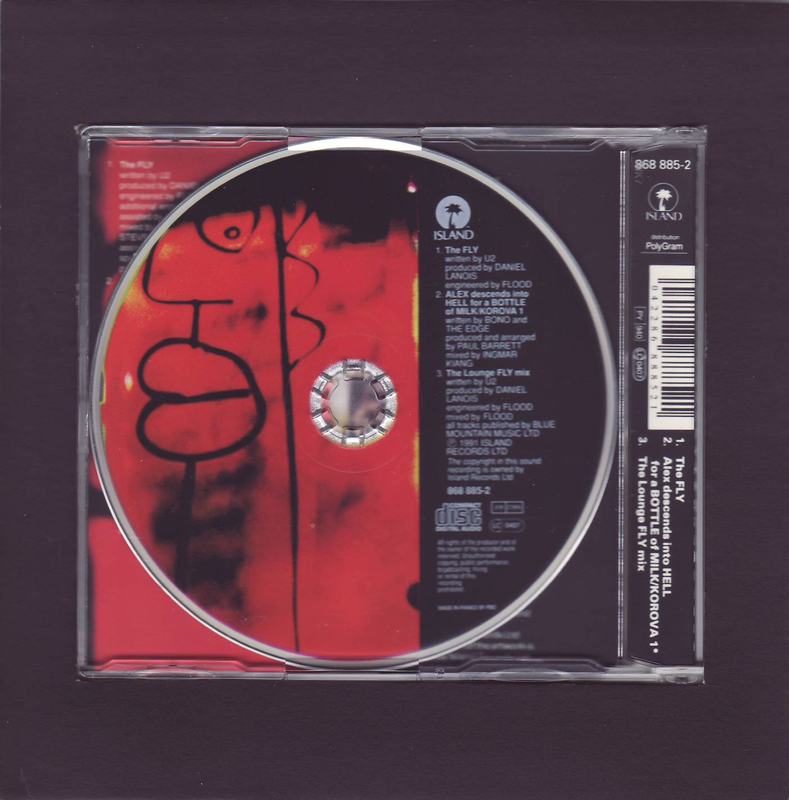 Back of CD inside cardboard surround. 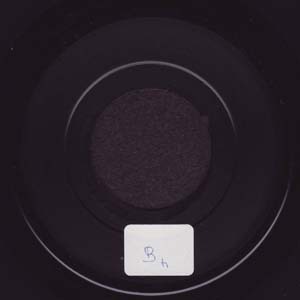 B-Matrix: "IS 500 B1 868 8847-B-1"
A-Matrix: "IS 500 A RE-2-4 S114728A RE-2 -2 020 114728-1A-1"
B-Matrix: "IS 500 B1 S114728B-3 020 114728-2B-1"
A-Matrix: "IS 500 A RE-2-4 S114728A RE-2 -2 020 114728-1A-1 II"
B-Matrix: "IS 500 B1 S114728B-3 020 114728-2B-1 II"
A-Matrix: "IS 500 A RE-2-3 114728-IBER RE-2-2 A"
B-Matrix: "IS 500 B-5 114728BIBER-"
A-Matrix: "IS 500 A RE-2 1-2"
A-Matrix: "IS 500 A RE-2 -1 Q1"
A-Matrix: "IS 500 A RE-2 1-1"
A-Label: No label. Large hole. 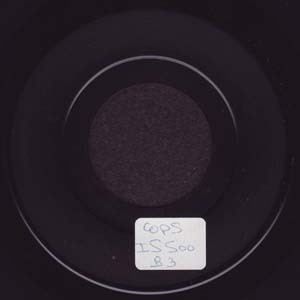 Sticker with "COPS IS 550 B3". 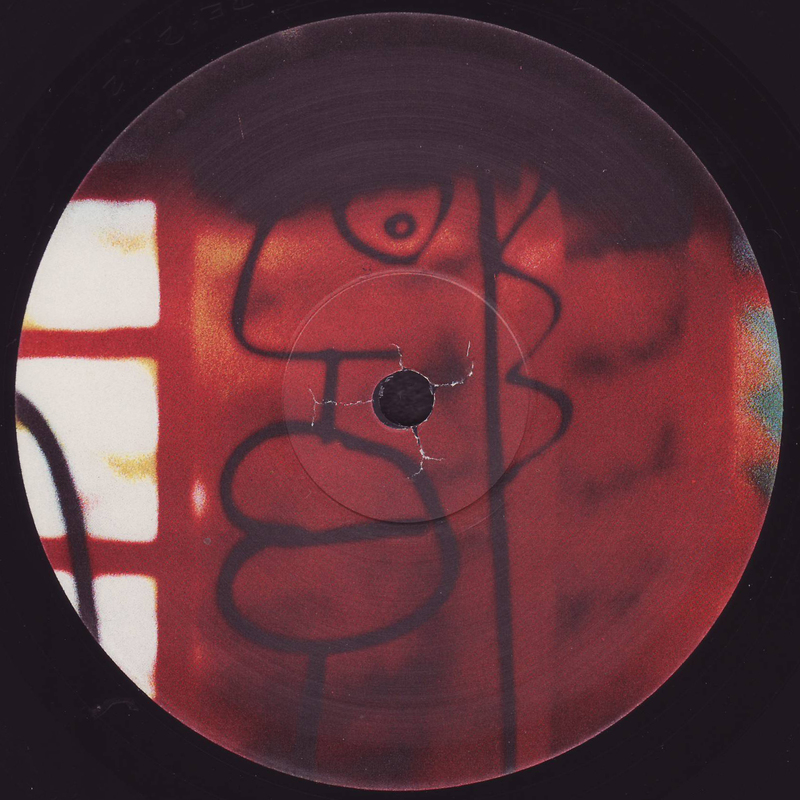 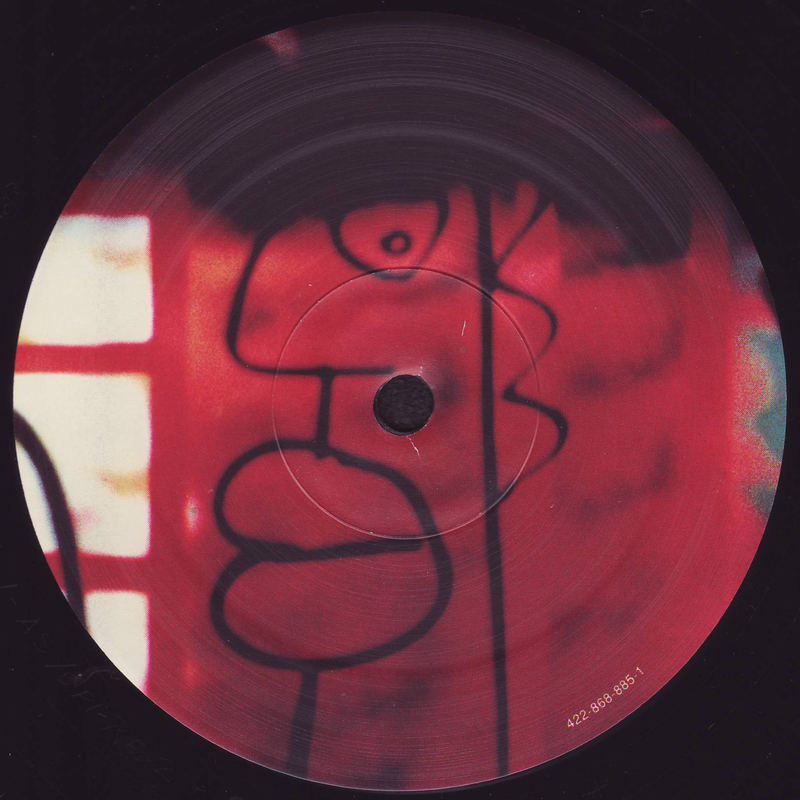 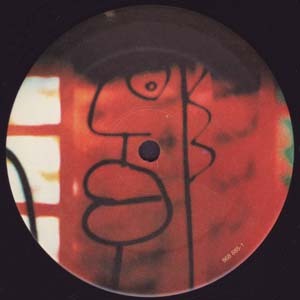 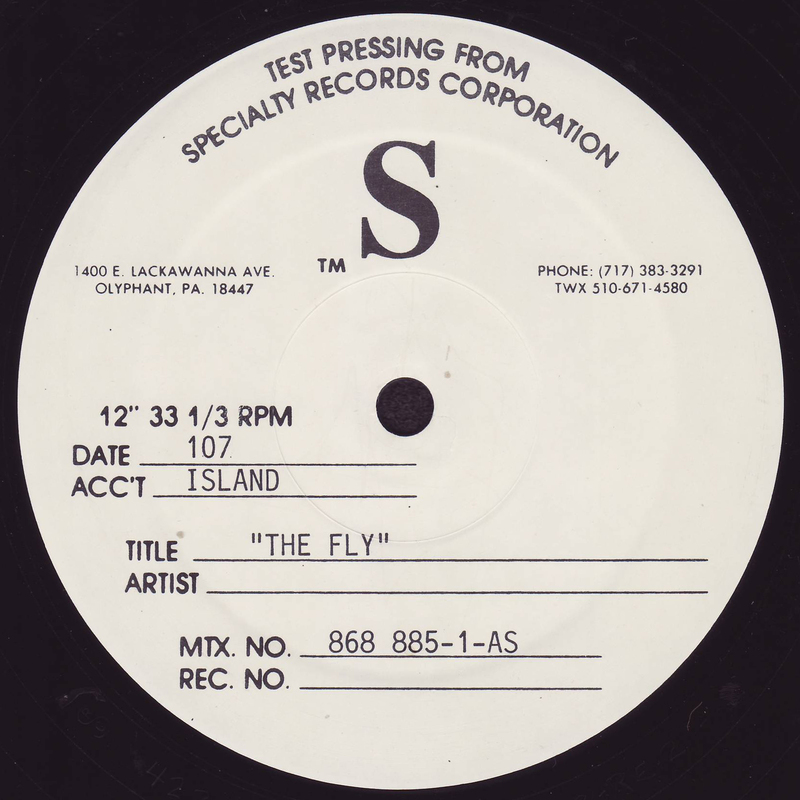 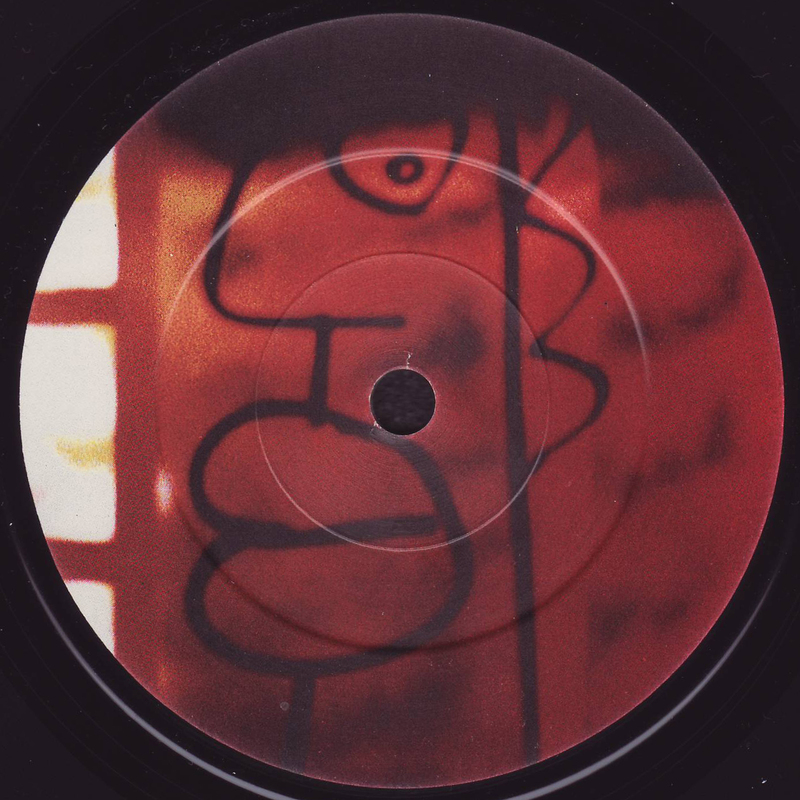 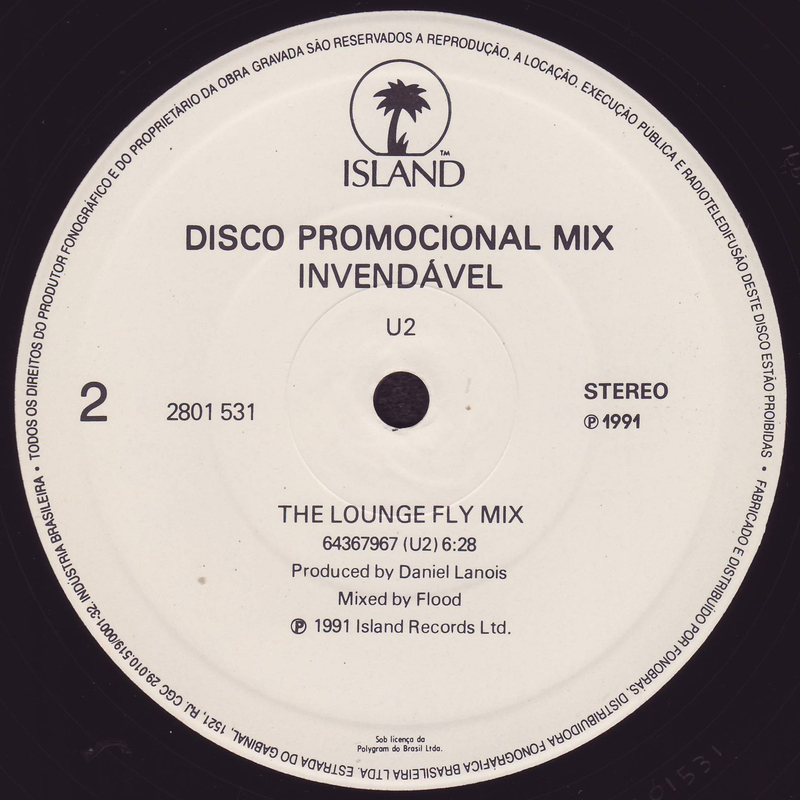 B-Label: No label. Large hole. 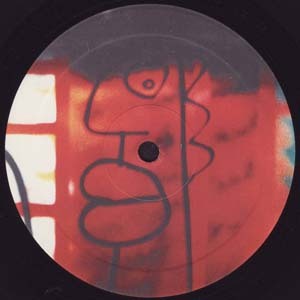 Sticker with "B4". A-Matrix: "12 IS 500 A-RE-2-4 A78759RE2-1"
B-Matrix: "B78760-1 12 IS 500 B-4"
A-Matrix: "2801531 1 01 P1991"
B-Matrix: "2801531 2 01 P1991"
Front PS: With big "U2". A-Matrix: "868 885 1 A RE-2 1"
B-Matrix: "868 885 1 B1 1"
A-Matrix: "12 IS 500 A RE-2 -3 868 8851-A RE-2 2"
B-Matrix: "868 8851-B-2 12 IS 500 B -3"
Front PS: with title sticker. A-Matrix: "020 614728-1A-1 12 IS 500 A-RE-2-2 S614728A RE-2-3"
B-Matrix: "020 614728-1 B-1 12 IS 500 B S614728B-2"
A-Matrix: "12 IS 500 A-RE-2-4 614728A-IBER RE-2-1 A"
B-Matrix: "12 IS 500 B -3 614728BIBER-1"
Front PS: With "MAXI-SINGLE 12 INCH".